In 5 weeks, I dropped 71 seconds off my 5k and ran a lifetime road PR. Pretty snazzy. It's sort of hard to know what to say. 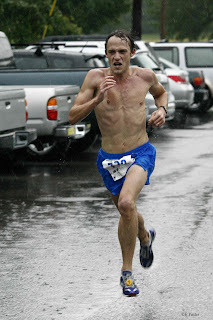 Since I've been focused lately on the experience of running, and since the experience of running a PR--what it felt like during the race--is still fairly fresh in my mind, I thought I'd try to get it down in words. Elly Foster got a couple of great shots of me coming through the last 200 meters toward the finish--they are posted down below. I am surprised to see just how intense I am. Or, rather, it is strange to see what that intensity looks like from the outside. I remember it, quite vividly, from the inside. When the gun went off, I felt a strong surge of adrenaline and I was clear of the field in my first three strides. I had been hoping to find a group to roll with today, as it's a flat fast course and a fairly big Nashville race. But I was not distressed to be alone. I felt the same power in my legs that I had been feeling during the prior week of rest. 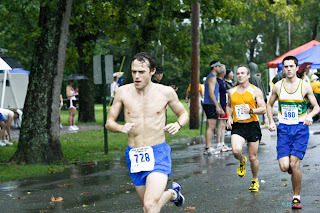 I knew then, 15 seconds into the race, that the body was ready to race. The goal for the first mile was 5:05. Just let the pace come to me and settle into a steady rhythm. Not too hard. But hard. Turn off the brain and run. The mile marker wheeled into view. I feel so good--what if it's 5:20? A glance at the watch: 4:59. Okay, I thought, here we go. The second mile included a slick bridge (did I mention it was DUMPING rain? ), and the lead biker went down on it. I dodged him and slowed down across it, then was right back in the race. I plowed through a few deep puddles and must have been hammering pretty good as I was down the road a half a mile before the biker got back on his bike and was back in front. The last half of the second mile included a couple of hills. I was conservative on these, thinking stay on the line, don't press. The second mile split came up and I was still feeling strong. 10:03. I knew I had it. The last mile, I tried to enjoy it. I concentrated on staying strong, and running hard, and I never felt fatigued. There was no one around. Just me, the lead biker way out front, and second place nowhere in sight. 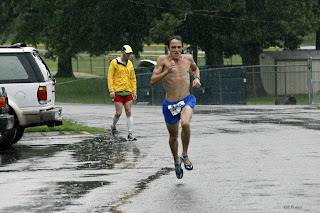 It was rain, effort, pace, body, legs--consciousness an afterthought. I looked for it, but couldn't find any pain. Three miles: 15:18. The clock came into view, and it read fifteen twenty something. I charged for the finish, through the line and kept on going like a wild animal. I think I almost knocked a few people down in the chute. I don't think they minded. A sound hollered out of me--joy. The difference between this race and the ones before? This one didn't hurt. The good ones never do. Damn it was good to see you roll! That's great Jeff! Keep it rolling! jeff that is just super. i am happy for you that you were able to accomplish it AND to enjoy it - indeed, to savor it - while it was happening. Great blog Jeff. Great run. awesome effort! great capture by Elly w/ you and the intensity and a _____ Thunder in the background. Plus, great writeup of the race. Great job! That's ridiculous. I'm using a lot of the language you're using in the blog with my swimmers to talk about pacing ("stay the line -- don't press" is great). Anyway, nice work! Hope we can catch up soon. Hey thanks everybody. This blogging stuff is pretty cool. It feels good to be able to share what sometimes seem to be kinda absurd accomplishments. Jeff - always enjoy your thoughts, and congrats on your accomplishment. “Hodiernum vive diem” - indeed.